Bring large pot of water that filled to about 3 inches below rim to a boil. Add the spinach gradually and with large spoon dunk spinach until all spinach is below water. Boil for about 2-4 minutes until spinach is wilted. Immediately drain in colandar and let sit until fully drained. (This process is good to start in the very beginning as you can let it sit while you start on some of the other components such as the vegetable saute and marinara). Occasionally stir the spinach in the colander and press down to squeeze out excess moisture. Lay out spinach on a cutting board and chop. In large bowl stir ricotta cheese and egg. Mix well. Add in basil, oregano and salt and stir again. 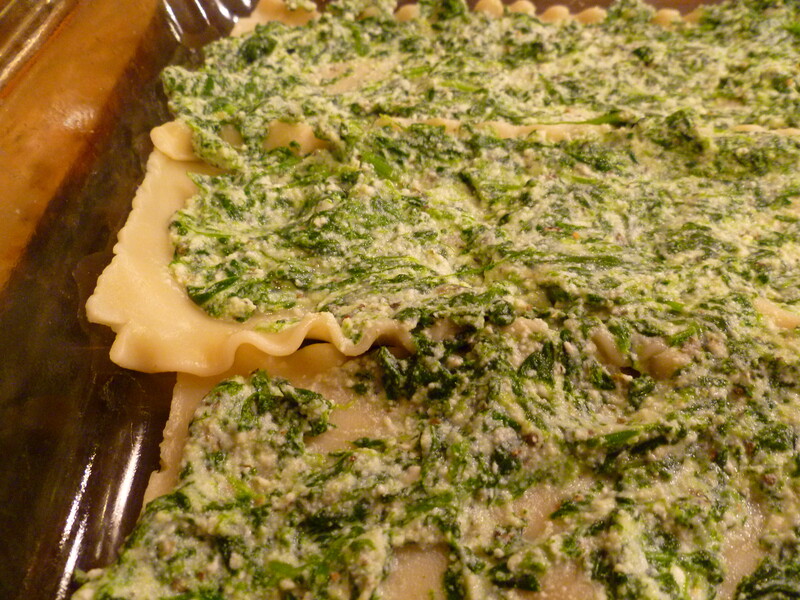 Gradually add in cooked and chopped spinach until completely combined. In saucepan, heat all ingredients except salt over medium heat. Bring to a simmer and simmer for 10 minutes. Taste for salt and add as necessary. 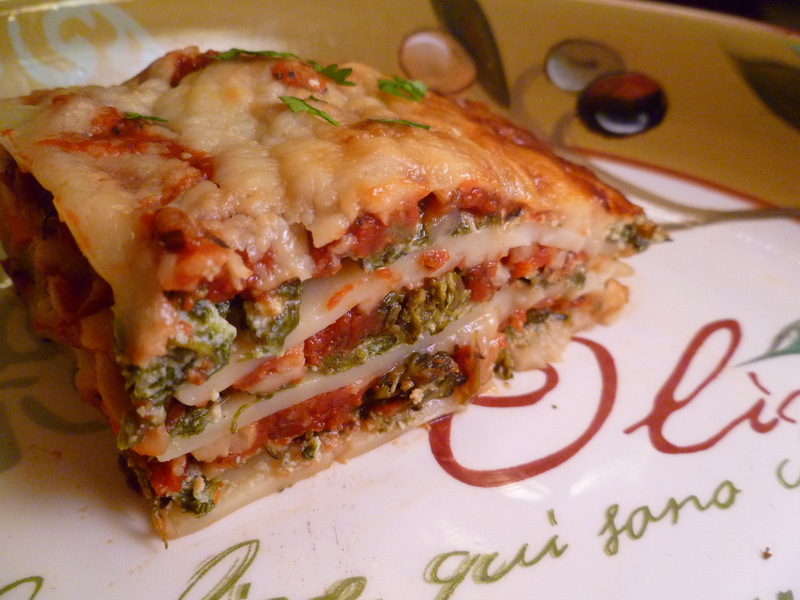 In a 10×13 casserole dish, lay 3 lasagna noodles out flat. 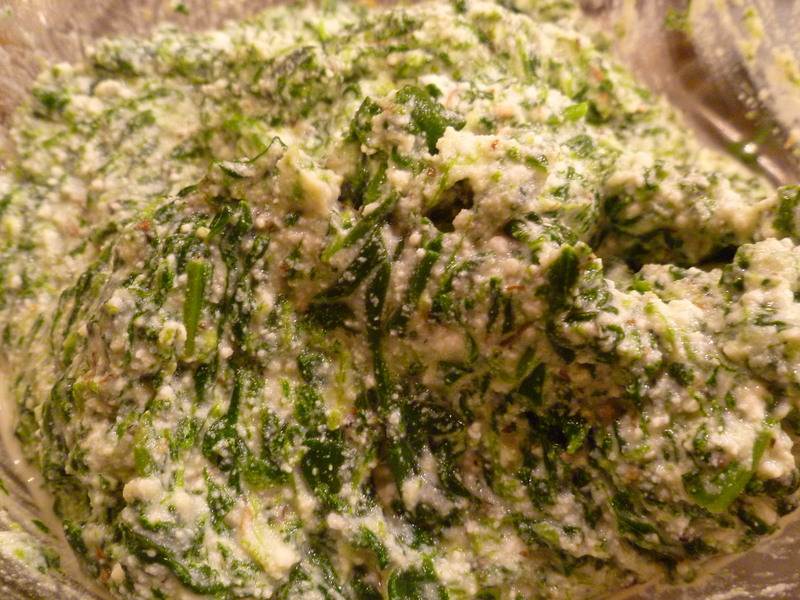 Spread 1/3 of the spinach ricotta mixture on noodles. 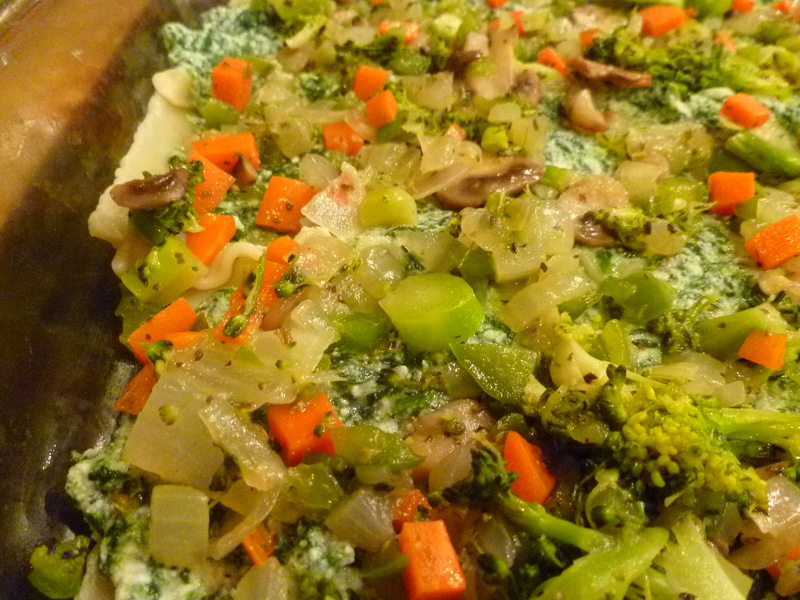 Spread/sprinkle 1/3 of the vegetable saute on top of ricotta mixture. 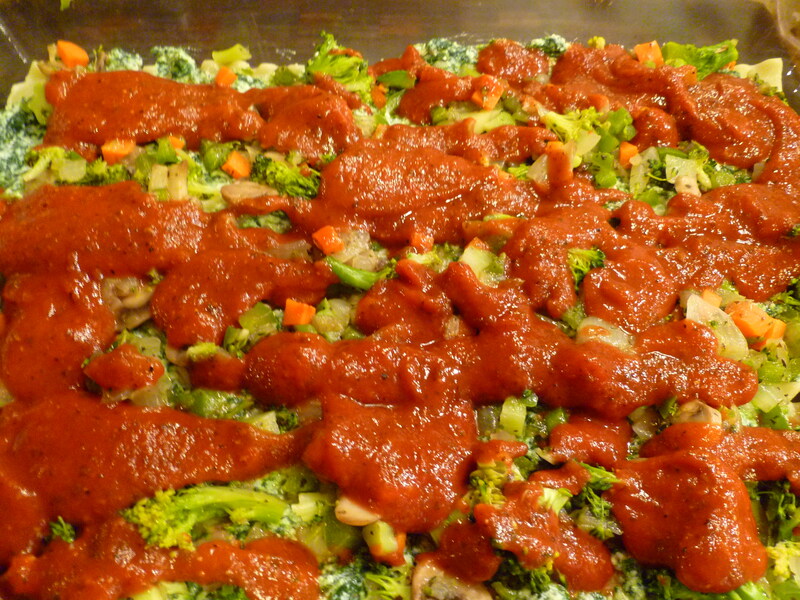 Evenly pour 1 1/2 cups of the marinara sauce over the vegetable saute. Sprinkle 1 1/4 cup of mozzerella and 1/4 cup of grated parmesan on top of marinara. Repeat 2 more times for a total of 3 layers. 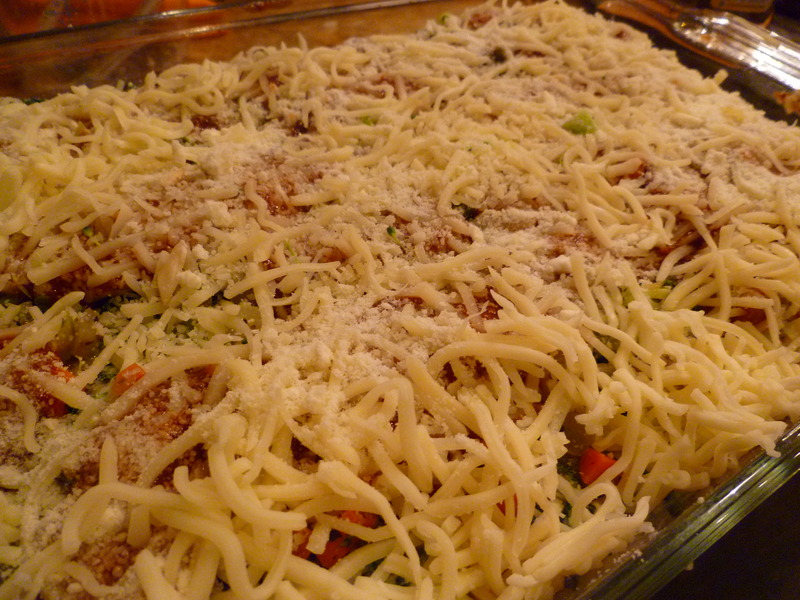 Sprinkle the leftover mozzerela cheese on top (there should be about 1/2 cup extra leftover). Cover lasagna with foil and bake for 45 minutes. Remove foil and bake another 15-20 minutes or until cheese is bubbly and lightly browned in some areas. Remove from oven and let sit at least 10-15 minutes before slicing. Footnotes: To avoid lots of little broccoli “crumbs” when chopping, do not cut through top part. Only cut the stems of broccoli. Once cut through, go back and cut the stems lenghthwise again locating where the head meets at the stem and cutting between the small florets until you have very fine florets. You can then cut up on the stems toward the florets. The idea here is to have fairly small pieces–you don’t want to have big pieces of broccoli in this dish. See picture of vegetable saute finished for idea on size. If you like it extra saucy, prepare more marinara to pour over the top when serving. Love love love this recipe! It took a while to prepare (I’m not fast chopping and mincing) but it was so worth it. 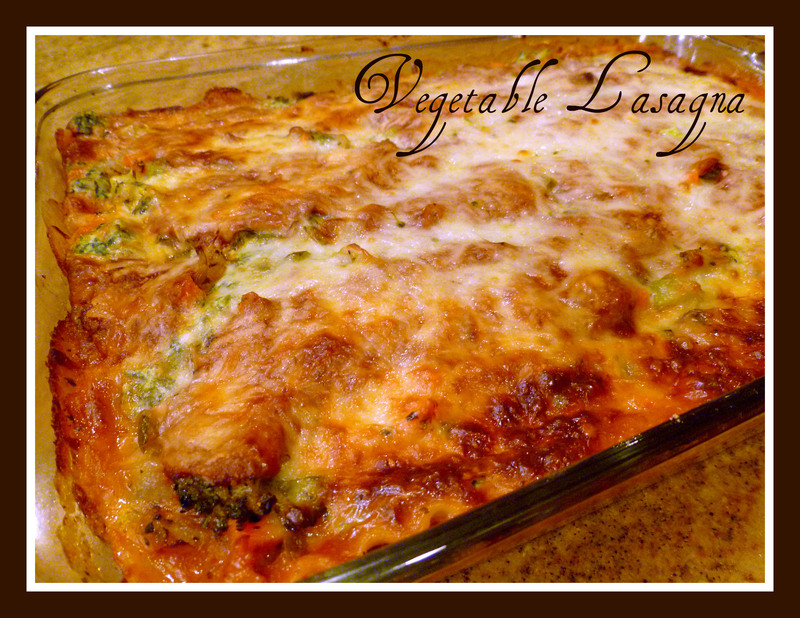 I never thought I would like lasagna with broccoli in it, but it was yummie! Thanks for sharing! Wow, Tony! I am so honored you tried it and even more happy you liked it! Thank you so much for sharing that with me. You made my day! Oh, mushrooms would be lovely! Let me know how it turns out. Ok, I never reply to anything on the internet but this lasagna was amazing. I have been a vegetarian for a while now and its hard to find good food and multiple ideas, at least for me,lol. It always seems like the same thing every week. This lasagna on the other hand, knocked my socks off! The best I have come across in a long time. Thank you for taking your time to put this up for everyone. Wow, thank you so much for the lovely post! I am so excited you loved it. I really appreciate you taking the time to let me know how you enjoyed it. I hope it brings you and your family a warm meal every so often this upcoming winter. Thanks again!